I’ve been trying to maintain a healthier lifestyle lately by eating lighter and more nutritious foods as well as resuming my exercise routine. I don’t really believe in diets–just slight food control along with making sure to exercise. It feels great since I love fruits, vegetables, and grains anyway; it’s just the working out part that’s more of a challenge for me. 1. Whisk together juices, soy sauce, and garlic in a bowl. Slowly whisk in oil; set dressing aside. 2. Cut 2 avocados into 1⁄2″ cubes and thinly slice the remaining avocado. Put cubed avocados, half of the hemp seeds, and kale into a serving bowl. 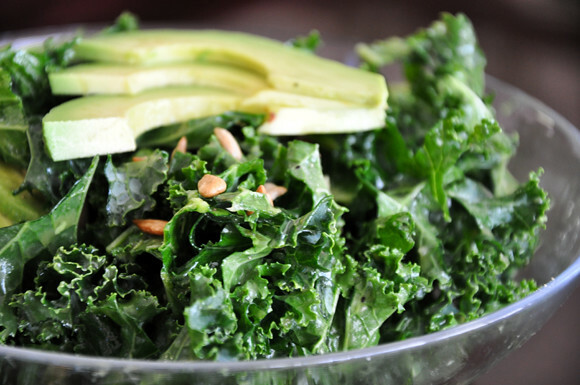 Toss kale mixture with dressing and season generously with salt and pepper. Divide salad between plates and garnish with sliced avocado and remaining hemp seeds.